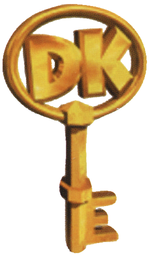 Boss Keys are items in Donkey Kong 64 that each unlock one of the numbered padlocks of K. Lumsy's cage. There are eight Boss Keys, and as their name suggests, each is guarded by a boss. The Kongs can obtain each one by defeating a boss, except the eighth and final one, which is located in Hideout Helm, behind a steel door in King K. Rool's throne room. The Nintendo and Rareware Coins are needed to open it. After opening a padlock, K. Lumsy boisterously celebrates and causes a heavy tremor. This usually opens previously-blocked entrances to other levels. After using all eight Boss Keys, the cage containing K. Lumsy lifts, and he is freed. Grabbing Key 8 in a certain manner can cause it to not be saved to the inventory; however, if the player revisits Hideout Helm, it respawns. This page was last edited on January 29, 2019, at 02:52.